Attention all Will County residents! 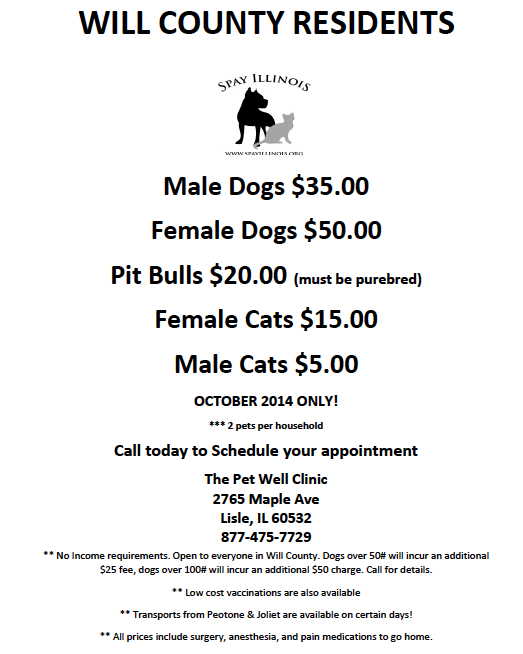 Throughout the ENTIRE month of October, Spay Illinois is offering unbeatable deals on spay/neuter surgery! Call ASAP to reserve your spot on their schedule. (877) 475-7729. Prices listed include surgery, anesthesia, and pain medication to go home. They will also be offering transport from Peotone and Joliet on certain days in October! Not a Will County resident? Spay Illinois offers affordable, easily accessible wellness care for your pets every day. Give them a call to find out what your pets qualify for!